This is a great easy to carry system that allows you to see what's down below. Whether it's for fishing or just research, this inexpensive starter kit is a great way to go! The rechargeable battery allows you to use this for up to 14 hours without a need for any electric outlets. It is also expandable so you can add another camera as well. The camera also has the ability to rotate 360 degrees so you can see everything around the camera in a COMPLETE circle! 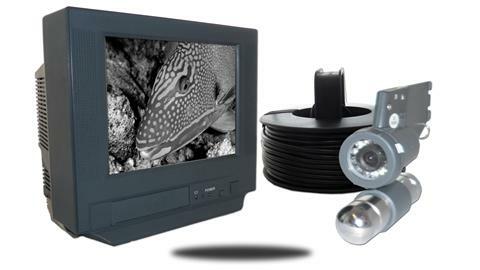 This camera system can also connect to any of our DVR Recorders so you can record everything you see and watch it back later. You can also use your own recording devices. It is compatible with practically any recording device on the market. More Info 7inch B/W high resolution screen display with panning camera. Infrared 0 lux night vision. The camera can rotate at an angle of 360. Input for 2 camera or VCR.